What does using the right tool for the job mean to you when you're working in the kitchen preparing and cooking a great meal you want to be perfect? For different people that will naturally mean different things, but here I'm looking at a kind of middle ground. This site is all about taking the work that you do in your kitchen and making it into a sensible article so that all the readers will get a better understanding of how this or that is done. So in this post, I'm going to stay general and look at why we use certain tools to do certain jobs. If you follow these few simple ideas, you'll find yourself getting excited about using the right kitchen tool to do the job at hand. You'll feel like a million bucks when the fruits of your labor come to into being. 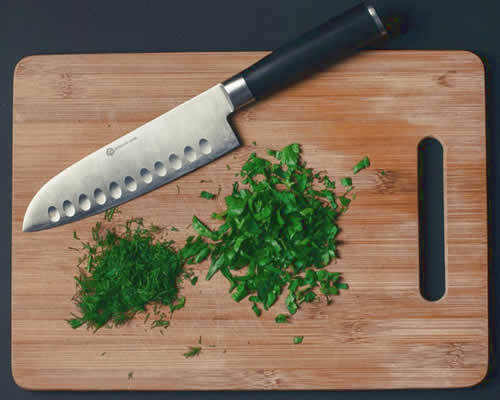 The first place I generally tend to start is getting out my favorite chopping board and the knife I prefer to use on most of my food preparation work. Now we all have our own preferences here, so all I can do is let you in on my own little secrets here! I have a big, high density plastic chopping board that I've used for a few years now and it's just perfect for all the prep work I do with vegetables. It's big enough to handle larger vegetable items such as eggplant, butternut squash, pumpkin and the like, while being tough enough to withstand the daily onion, garlic and tomato slicing and chopping that form the basis of many of the Mediterranean style meals I like to produce. I want to make it very clear that I ONLY use it for vegetative foods. I have a separate plastic board for raw meat and a good cook will always make sure they never mix the two. There are a ton of potentially harmful bacteria that live on raw meat that once transferred to salad items that are eaten raw can lead to upset tummies! My knife of choice is a quality 12in Chef's knife that is razor sharp and will slice through just about anything with perfect ease. It is often said that a blunt knife can be more dangerous than a really sharp one and I agree. When the blade is sharp, it will cut through the item of food easily and without the need for any undue pressure from the cook. A blunt knife needs more pressure and if it slips because you're forcing it, it will cut you just as well as a sharp one! Again, I'm going with my own preferences here, which are stainless steel with heavy bases that cost me a small fortune almost 20 years ago. They came with a lifetime guarantee and so far they have kept their maker's promise, looking as good today as they did when I got them. Of course, I do look after them well, but I think when you have good quality equipment that you paid highly for, you're going to be more inclined to make sure you look after them! My mainstay for cooking veggies is a 10 inch deep pot that I fill with about a half inch of water and let the contents "steam" rather than boil in deep water. Veggies cooked this way keep their flavor better and don't turn to mush so easily! Don't be too surprised to hear I do a lot of frying, since Mediterranean dishes are based around meat or fish fried fairly quickly in olive oil. Same goes for onions, garlic and tomatoes as already mentioned, which make a great base for many dishes. For this I use a 16in heavy based Teflon coated cast iron frying pan with steel handle. I can put it under a grill if needs be, which is very handy when making very thick Spanish style potato omelets. I have larger stainless steel pots for stews and casseroles and they all have steel handles riveted to the body, making them very strong, robust and oven-proof. So I can take a large pot off the gas ring and pop it into the oven to slow cook and finish off. As already mentioned, I "steam" my veggies in a regular pot in shallow water. But I also have a 16in stainless steel steamer that I occasionally use if I'm cooking for a larger number of people and need the extra size to cope with the extra food. There are plenty of options here, with bamboo steamers being pretty popular these days. Steaming vegetables is a great way of locking in the goodness as well as the flavor that boiling takes out and I thoroughly recommend you cook your vegetables this way if you like to eat healthily. I don't want to go into too greater detail over electrical appliances such as food processors as I'll cover that in their own article. But I do use my old Kenwood Multi-Chef that I've owned since the mid 1990s and it still performs perfectly every time. I use it mainly for making cake and dough mixes as it takes a lot of the labor out of mixing up ingredients. It's got all the chopping and slicing attachments you could ever want, but I never use any of them since I prefer to slice and dice with my knife and chopping board! It also has a very handy spice mill attachment that I do use a lot. It is especially good for creating multi-spice powders for things like curry dishes where the aroma and flavor of freshly milled seeds far outweigh the lackluster offerings you get in ready-made spice powders you buy at the store. If you have some choice as to owning the right kitchen cookware for every cookery job, try to collect the best quality cookware sets and individual items and then you won't go far wrong. It pays to buy the best you can afford and use the best you can buy!